Hundreds of Palestinians celebrated, Friday, the reopening of Bab al-Rahma Mosque of Al-Aqsa Mosque Compound, which was closed by Israel since the year 2003, and the Palestinians were denied access to it since then. 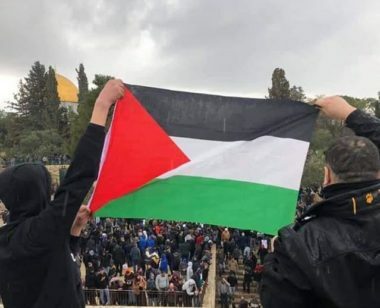 Media sources in Jerusalem said the Palestinians gathered in and around Bab al-Rahma and raised Palestinian flags on it while chanting and celebrating the reopening of the holy site after repeated massive nonviolent protests. The Palestinians, including the head of the Waqf and Islamic Endowment Council, along with dozens of religious, social and political figures, managed to enter the site, and held prayers there for the first time since the year 2003. Sheik Ekrima Sabri, the head of the Supreme Islamic Council and the former grand Mufti of Jerusalem, led the prayers in the hold site, and said that Bab al-Rahma is an important part of the Al-Aqsa Mosque, and demanded Israel to stop meddling in Islamic holy sites. Despite the massive Israeli military and police deployment around Al-Aqsa and the Old City, dozens of thousands of Palestinians managed to enter the holy site to perform Friday prayer. It is worth mentioning that the Israeli military and police have abducted overnight at least fifty Palestinians from Jerusalem.